In 1985 Don Moyer was just another sailor with a "new" good old boat - a 1971 Seafarer 31 complete with an Atomic 4. His wife, Brenda, laughs at their naïveté in agreeing to attend a used boat show with the mission, "We're not buying anything." They were restoring a historical townhouse in Harrisburg, and they both had full-time jobs. It seemed like enough. So how was a guy like this transformed into the Atomic 4 guru one boat and less than five years later? "One thing about him," Brenda says, "is he'll delve into anything body and soul until he knows everything there is to know about it." A man who enjoys knowing why things work and making them work better, Don soon had that Atomic 4 out of the Seafarer. In fact three or four perfectly good Atomic 4s came and went in that boat for the sheer joy of understanding and tinkering with them. "It got to be a humorous thing for people on the pier," Brenda notes. During the next four years, Don became the acknowledged guy to ask about Atomic 4 problems within their community of sailors. People asked for advice, and Don offered it. Eventually he began writing down new things he was learning about the engine and distributing this information to those who'd asked, in an effort to keep his previous advice as current as possible. This blossomed into a small newsletter to 65 people who Brenda identifies as "people we met along the way." Don's springboard into regional and national prominence was unplanned. Early on, Dan Spurr, editor of Practical Sailor, gave a positive - and unexpected (given his historic lukewarm feelings for the Atomic 4) nod to Don's modest efforts. This important blessing made all the difference. Don hopes that at some level Dan has actually rekindled some sort of affection for the Atomic 4. But Don says more than likely the nod was simply an example of Dan's profound interest in all aspects of the boating fraternity. Then, Brenda says, she and Don left for a vacation. When they returned after a week, Practical Sailor had profiled Don and established him as the answer guy for the Atomic 4. 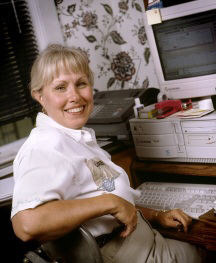 "We had 75 letters in the mail slot, and the answering machine was full," Brenda recalls. "We had to take a look at what we'd been doing as a hobby and what we wanted it to become." They went into business, incorporating as Moyer Marine Inc.
Don didn't quit his day job however. He continued working at an environmental resources company until his retirement two years ago. While there, he was granted a number of patents which resulted from that need Don has to see how things work and to make them better. His home-based business grew steadily until his retirement became not so much a retirement as a "job change," as Brenda characterizes it. "He changed jobs and brought one home. It worked very well," she says of the challenges of having a couple go into a full-time business together. "I reminded him, 'You're coming into my workplace now.' " Jokingly, she says she issued him the equivalent of her own "employee handbook" and noted who had seniority around that office. "We learned to give each other space," she says, adding, "This had become his dream, and I'm here to help him accomplish his dreams." In the beginning, Moyer Marine offered parts, the newsletter (which had gone upscale over the years and was named the Atomic-4 Caster), technical service and advice on the phone to newsletter subscribers, engine overhauls and checkups, and workshops. Slowly the newsletter began melding into chapters of a service manual. And finally, Don felt he had run out of material for the newsletter itself, so in April the last newsletter was mailed from Moyer Marine. But fear not because Don and Brenda have just published his Service and Overhaul Manual. It compiles the newsletter information in a manual that should be easier to use than the collection of newsletters. The business has expanded in other ways over the years. John and Ardis Featherman, longtime friends of the Moyers, handle the sale of new Atomic 4 parts, although Don still sells used parts to people as the parts become available. The business relationship with Featherman Enterprises has freed Don from the computerized aspects of tracking parts inventory and billing. 0ther relationships have developed as well. Don and Brenda have discovered a "metal genie," Brian Nye, of Nye's Machine & Design, who fabricates parts for the Atomic 4, such as the water pump extender bolt that Don designed to improve the Atomic 4 owner's odds of getting at that bolt and removing it in one piece. They have a relationship with Spring Garden Repairs, which repairs blocks and heads for them when the need arises. 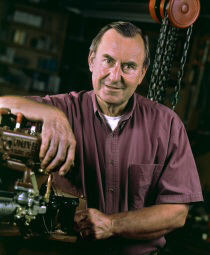 And Don's nephew, Terry Kuhn, of Engines by T.K., rebuilds the mechanical fuel pump and helps Don in the rebuilding operation as needed. Don's son, Stephen, the photographer who illustrated these pages and the cover, helps with the print production of the newsletter and manual. 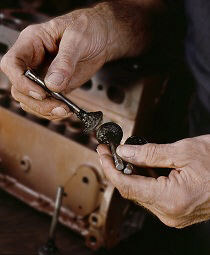 Don still conducts workshops on the engine, and does rebuilds and engine checkups. He continues to offer technical advice on the phone when he's home, but he's not as tied to the phone as he was. These days the Moyers want to go sailing, and they should. Two years ago they sold the Seafarer and bought a 1980 Catalina 30. Don had a bias against widebody production boats, telling Brenda that boats, such as the Seafarer, were much safer in the event that they ever took multiple rolls some stormy night near a rocky shore ... and the rest of the litany. The trouble with the Seafarer was that it was a bit tight for two in the cabin. Brenda says down below they passed each other by sliding sideways. They like to entertain, too, and they felt the space was too tight for that. Brenda Moyer supports Don's dreams. They say friends chuckled at them behind their backs when they returned from that first used boat show beaming with the excitement of prospective boatowners. They told everyone about their "new boat" - about how it had 'everything on it and wouldn't need another thing. "Ten years and $10 grand later," Don says, "we realized we'd done everything we could do to that boat except make it bigger. Then one day Brenda walked down into (and it really is walking down into) a Catalina and asked, "Tell me again why we can't have one of these?" Before long the Moyers had a Catalina. The bad news was that the Catalina had a two-cylinder, 11-hp, Universal 5411 diesel inside. The good news was that the boat was being sold for a very low price because the diesel didn't work anyway and of course Don intended to put an Atomic 4 in it. The bad news is that the engine is working perfectly now. Don discovered that someone had connected the hoses backward, and not even the diesel experts had caught on. Don says of this engine that it was Universal's first answer to the aging Atomic 4 fleet. But he mocks the thing: "All my friends have bigger engines in their riding lawn mowers," he says. That diesel engine (perish the thought!) is going to stay in the Moyer's boat for awhile, however. Don says, "Whenever I go near it, Brenda throws her body in front of it. She wants curtains, cushions, and so on. So it won't get an Atomic 4 anytime soon." As it turns out, that's just as well. The shaft of the Atomic 4 is at such an angle that repowering with one would cause structural modifications to the boat itself. Even Don doesn't relish that thought.Besides, he's just ordered an auto-pitching prop for it, which he notes is "worth 10 percent the retail cost of my boat, but is - by all accounts - a magical device. I'm like a kid at Christmas over this." Of course Don deliberated about whether he was being "called." Perhaps this was a new directive, this time to save the Universal 5411. But Brenda's common sense prevailed. "I asked him, 'We're still working on accomplishing this dream; could we put the next dream on hold for a while?"' she says. So expect the Atomic 4 guru to stay in the business for the foreseeable future.